Inequality… in a road network? Nikki Ray, from London, has been serving as a human rights monitor in the West Bank for the Ecumenical Accompaniment Programme in Palestine and Israel. She has been writing about her first hand experiences and how Palestinians are affected every day by the Israeli occupation Palestine. Freedom is glad to be collaborating with Nikki to bring her accounts of life in Palestine to our site. Recently the British Parliament made a historic vote, with the majority of 274 votes to 12, to recognise a Palestinian state. The vote was a symbolic one but affirmed the need for a Palestinian state whilst Israel is still occupying Palestine in the West Bank and blockading Gaza. Whilst serving as a human rights monitor in the West Bank with EAPPI I have seen first hand the oppressive polices of the Israeli occupation which are present in ever aspect of daily life for Palestinians, including the road network. My team based in Yanoun recently visited Beitin, a village of 2,500 people located about 2 kilometres east of the edge of Ramallah. Like many other villages we have visited in the West Bank Beitin experiences similar problems of settler violence from neighbouring illegal Israeli settlements and incursions into the village by the Israeli army. 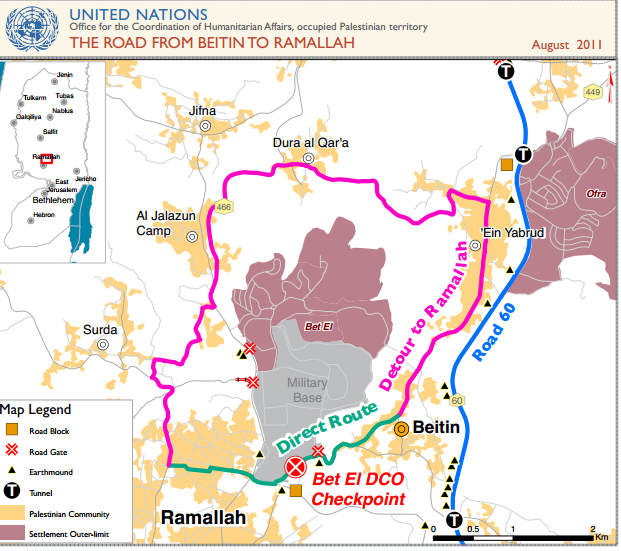 However unlike many of the other villages we cover Beitin highlights the inequalities present in the road network through the West Bank. Unfortunately for Beitin its location has caused its population a life of frustration. The settlement of Beit El, where the Israeli Civil Administration in the West Bank has its headquarters, was built in 1977 to the north-west of Beitin village. To the east of the village is Route 60, the main highway connecting the north and south of the West Bank. 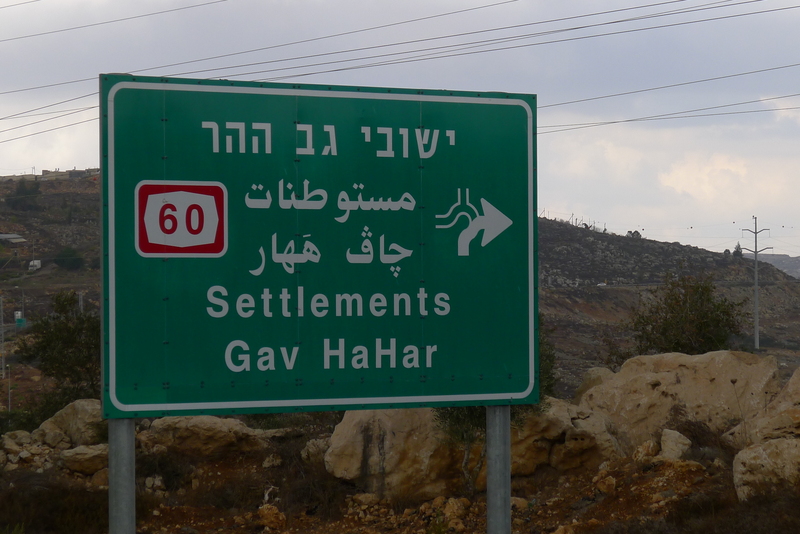 To the south there is an illegal Israeli settlement outpost called Givat Assaf, which was established in 2003. Our contact in Beitin, Saeyd Abu Sari, took us to the western edge of the village. 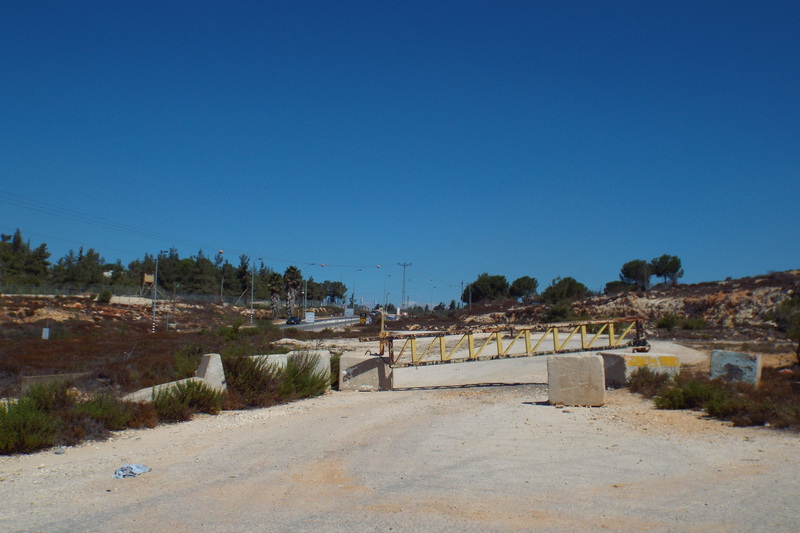 Here an earth mound and a metal gate, put in place by the Israeli authorities, prevent villagers from exiting the village to the west by Beit El and travelling to Ramallah. Using this route the journey used to take 5 minutes drive. 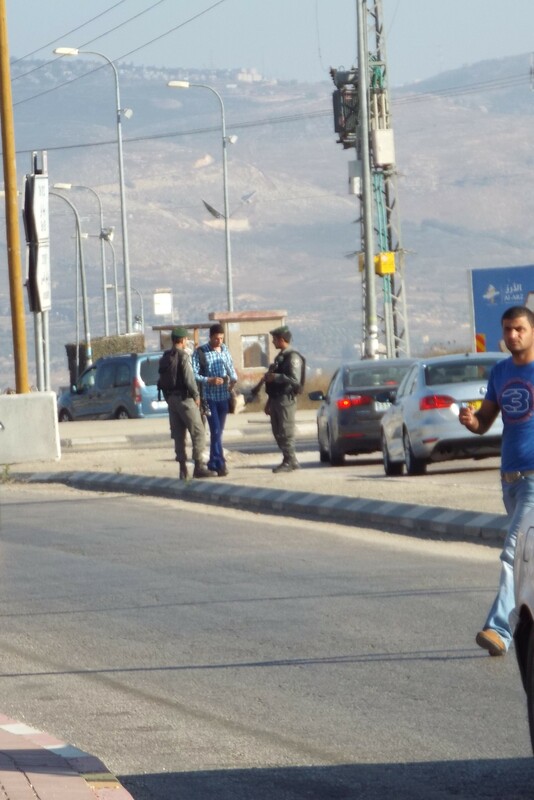 Palestinians are now prevented from driving on this stretch of road towards to Palestinian city of Ramallah. There is another road block preventing villagers from getting onto Route 60. This metal gate was put there in 1996 by the Israeli authorities. This road block is near the outpost of Givat Assaf. Due to the road blocks villagers have to drive north to the neighbouring Palestinian village of Ein Yabrud in order to get onto Route 60. According to Saeyd the drive to Ramallah now takes 30 minutes as villagers have to drive 18 to 20 kilometres avoiding the road blocks to get there. Each journey taken to Ramallah takes 6 times longer than it did before the road blocks and costs substantially more in petrol or public transport costs. Saeyd told us that villagers have tried to walk to Ramallah from the west side of the village but have been prevented from doing so by the Israeli Army. There is an Israeli watch tower located near to the earth mound so anyone attempting to cross it will be seen by the Israeli army and stopped. 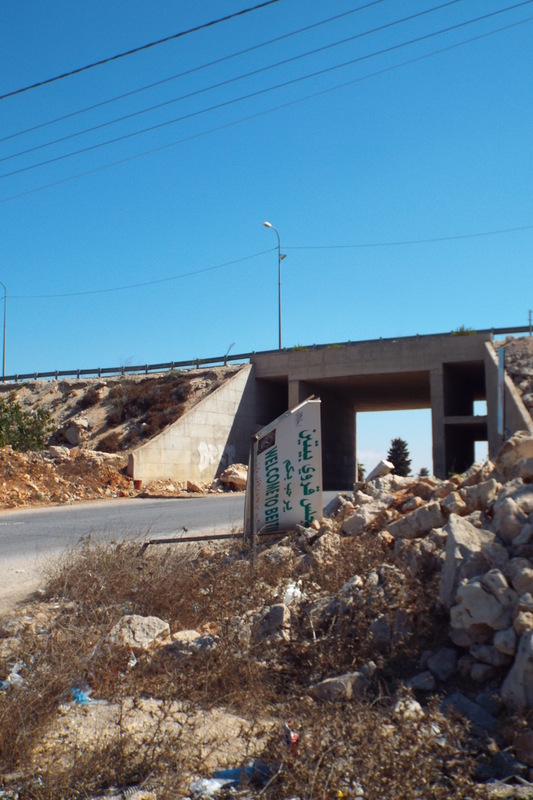 The road blocks substantially affects access to healthcare, access to education for disabled children who used to go to school in Ramallah, commercial livelihoods and agricultural livelihoods due to farmers being unable to access their land which lies on the other side of Route 60 or near Beit El and the army base to the north of the village . 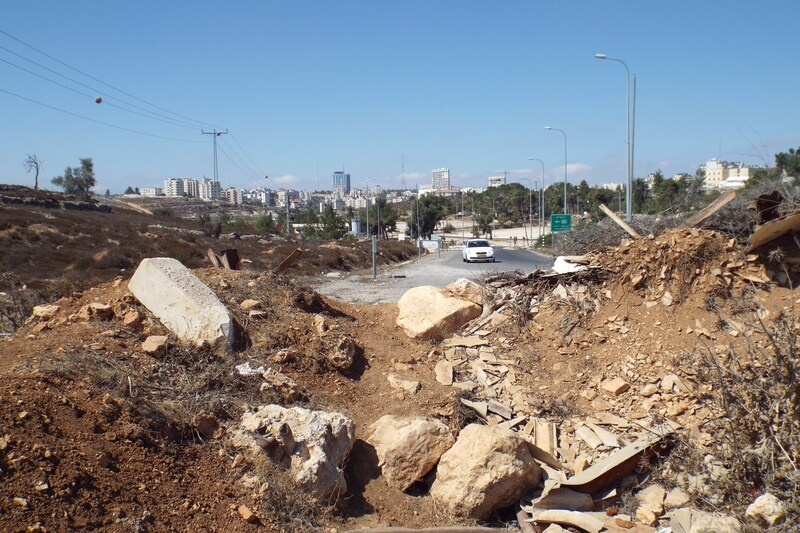 Saeyd told us that there have been multiple cases taken to the Israeli High Court about the earth mound preventing access to Ramallah, but with no positive results. As you travel around the West Bank it becomes evident that the road network is made for Israeli settlers not Palestinians. I will explain how. As you drive along highways you often see Israeli flags flying, but never Palestinian ones. You will pass many road signs to illegal Israeli settlements, often listing the amount of kilometres you need to travel to reach these settlements which often house only a few hundred people. Only Palestinian cities are present on road signs, it is a very rare sight to see a Palestinian village or town on a sign. Most Palestinian communities are prevented, by the Israeli authorities, from erecting a sign at the entrance to their community. Whereas when you pass an Israeli settlement you are greeted with the sight of huge welcome signs, lush gardens and strong security fences. Furthermore often roads near illegal Israeli settlements are designated as roads for Israelis only. At Zatara Junction, called Tappuah junction on road signs due to its location next to the ideological Israeli settlement of Tappuah, life is further divided. There are bus stops for Palestinians and bus stops for Israeli settlers, which are usually guarded by the Israeli border police. The organisation of the road network in the West Bank clearly seeks to ignore and remove Palestinian communities from the eyes of Israelis or tourists who travel along its roads. The policies of the Israeli occupation of the West Bank stretch to every element of daily life, in this case preventing freedom of movement. I have been sent by Quaker Peace & Social Witness (QPSW) as a human rights observer serving on the World Council of Churches’ Ecumenical Accompaniment Programme in Palestine and Israel (EAPPI). The views contained in this email are personal and do not necessarily reflect those of QPSW or the World Council of Churches. If you would like to publish the information contained here (including posting it on a website), or distribute it further, please first contact the QPSW Programme Manager for Middle East [email protected]for permission. Thank you.